Comments: On a crisp autumn day, four rural mail carriers pose in front of the Scottsville Post Office, the town's social gathering point. 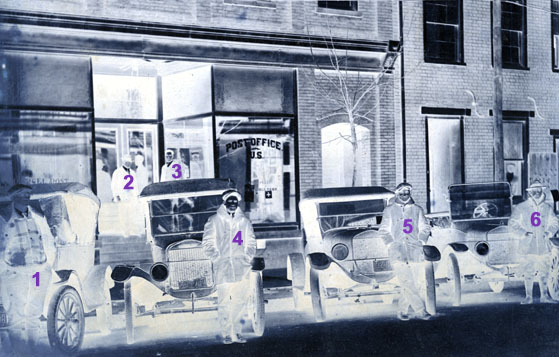 More than any other invention, 'motorized carriages' altered Scottsville life the most. 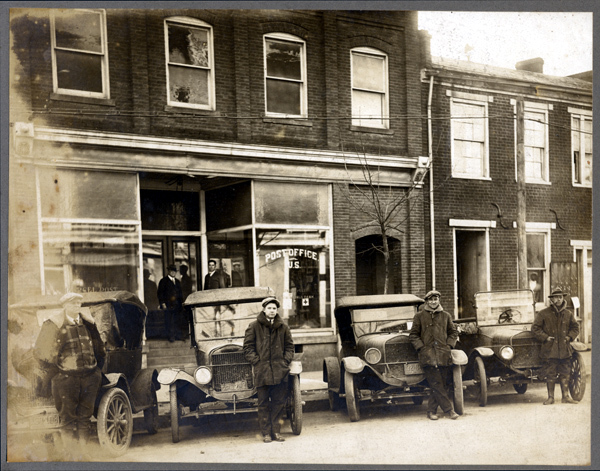 With mass production of the Model T Ford, cars were readily available and rapidly acquired by admiring Scottsville customers. Gone were the need for blacksmith shops and the big stable at the corner of Valley and Main Street, and, with the addition of the new James River bridge, the ferry, too. And leisurely time seemed to disappear, too, as townsfolk hopped into their cars and drove off someplace rather than sit on the front porch chatting or stroll downtown to watch the Richmond train pass through on warm summer nights. As in other towns, the advent of automobiles quickened the pace of Scottsville life. (1) D. Walter Moon, was a rural mail carrier and a large-animal veterinarian for the Scottsville area. (2) Samuel Gault, Postmaster of Scottsville, a position he assumed in 1893 and held for forty-six years until his passing in 1939. (3) Ashby Mayo, Assistant Postmaster and later Postmaster of Scottsville after Sam Gault's death in 1939; he retired as postmaster in 1958. (4) John Henry Phillip, Jr., was a rural mail carrier for Scottsville Post Office. (5) H. Sevell Geyh, was a rural mail carrier for Scottsville Post Office. (6) Henry Reeve Nicholas was a farmer and a rural mail carrier for a mail route across the James River in Buckingham County, Virginia. Reeve lived at 'Reeveland' just south of Scottsville.